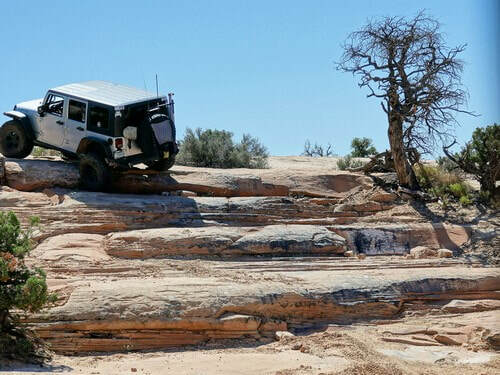 ​7 Mile Rim is a great Jeep Trail with an interesting arch, great scenery and numerous chances for "extra credit". 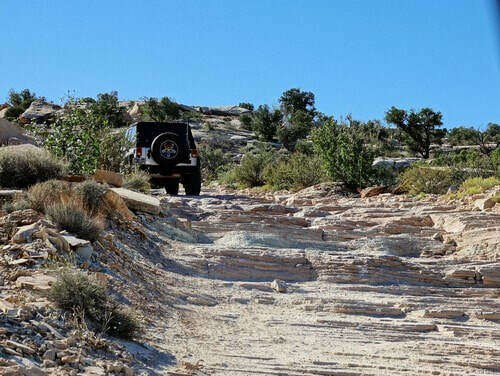 A full day if you do the entire trail. 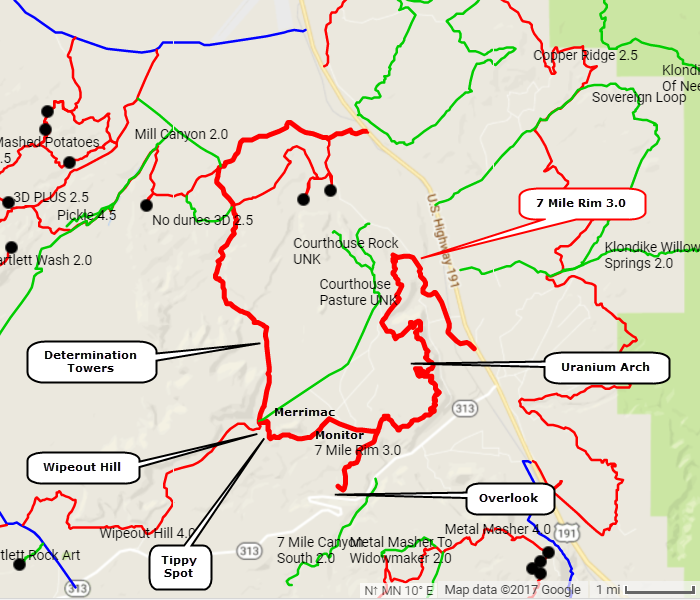 This trail is easy enough to do in either direction but most people run it clockwise. 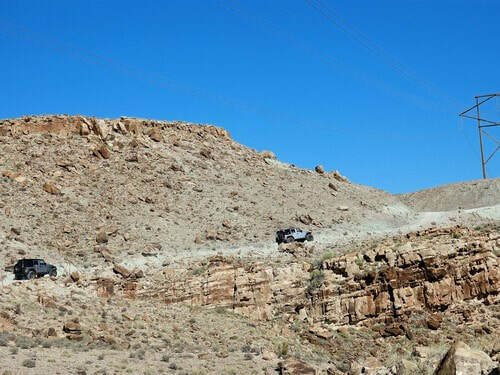 Start your trip from Highway 191 and follow the Cotter Mine Road up onto 7 Mile Rim. 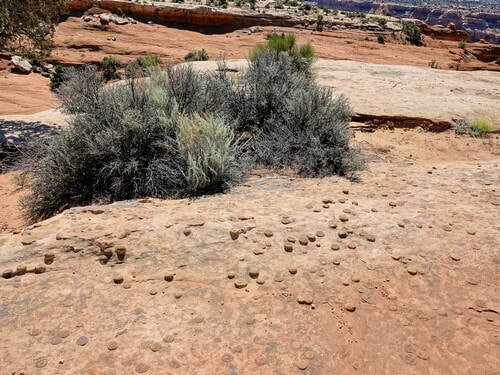 There are ledges scattered the entire length of the trail. This photo shows a typical one. Not terribly difficult, but they make for slow going. 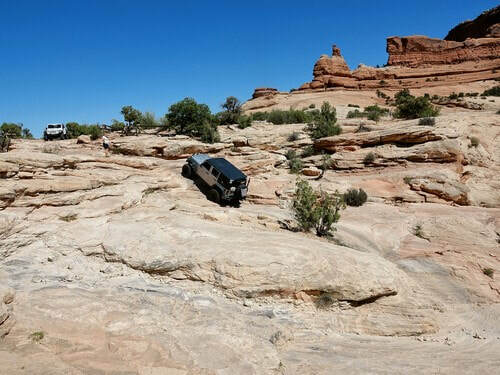 There are several places where the trail is close to the rim with great views of Moab and areas north of Moab. 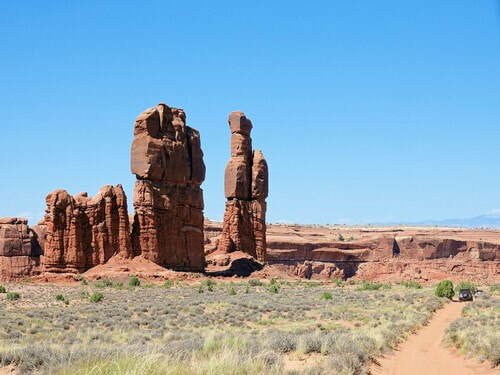 Monitor and Merrimac Buttes are a major attraction of the trail, and are visible for much of the first half. 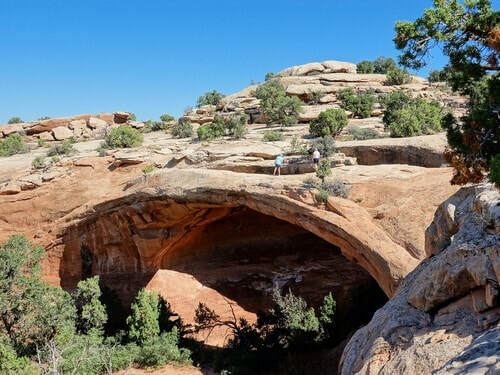 Uranium Arch is on a short loop off the main trail and is well worth a visit. 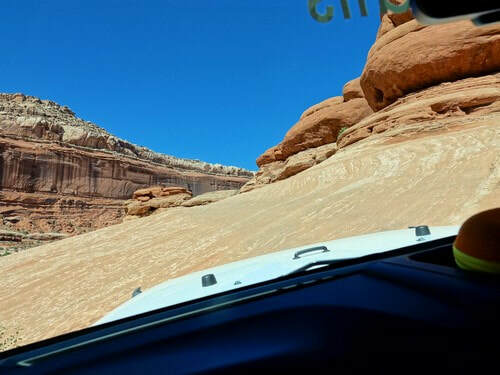 This track is slightly different than the Jeep Safari version, but it allows you to walk both above and below the arch. Extra credits are available along the entire trail. 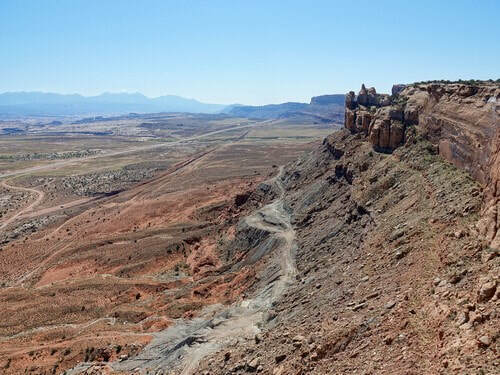 After leaving the Rim there is an in-and-out spur leading south to an additional overlook. 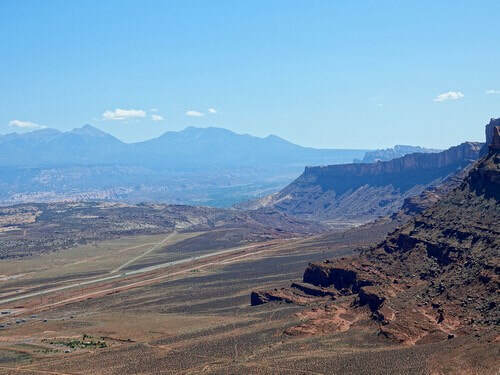 The trail passes between Monitor and Merrimac Buttes beyond the overlook road. 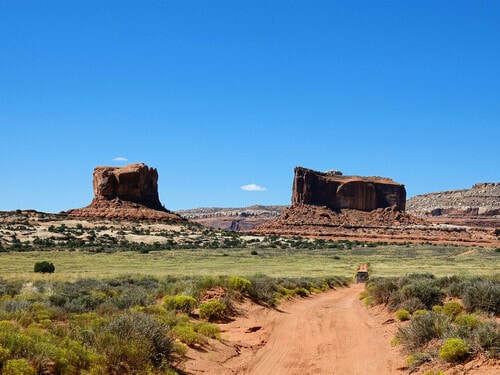 There is an area of "concretions" between the Buttes. Concretions are common features of sedimentary rocks of all geological ages. They are most obvious in sandstones and mudstones as ovoid bodies of rock that protrude from natural outcrops: clearly harder or better cemented than their host rocks. There is a tippy spot as you pass below Merrimac Butte. It is VERY intimidating to first-timers, but just grit your teeth, follow the white paint, and give it a go. 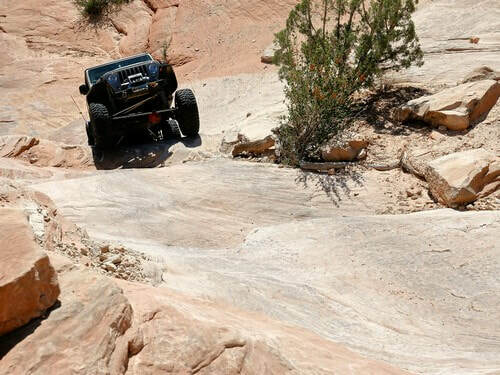 You may be encouraged by looking downhill - there are no Jeep parts scattered around. Shortly after the tippy spot this trail trail passes the top of Wipeout Hill 4.0. Many people running the entire length of 7 Mile Rim will go down Wipeout HIll and back up for Extra Credit. Going down the hill and heading for home is also a good option as the remainder of 7 Mile Rim is not very interesting. Determination Towers is the last significant attraction on the trail.